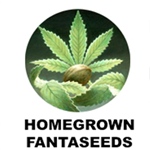 Homegrown Fantaseeds was voted \"Best seed company\" in the 1998 High Times Cannabis Cup, and they have earned even 6 more awards in the following years. They\'re still on the top of the seedbanks in Holland and they not only offer the original classic strains from the 1980\'s like the Mango, Top 44 and the Super Crystal to name but a few, but they also have created numerous award winning hybrids based on this genepool combined with popular genetics collected in the past ten years. In 2004 Homegrown Fantaseeds introduced the Cheese strain to the world by entering and winning a Cannabis Cup for this strain. The Blue Haze ( Blueberry X Haze ) became an easy victory during the 2001 High Times Cannabis Cup, walking away with the 1st place for best Sativa strain leaving Soma\'s NYC-Diesel far behind on a third place. They will keep on experimenting within their ever expanding genepool, and will continue to offer you the craziest seeds that can potentially grow exactly what you desire, tasty and potent buds.